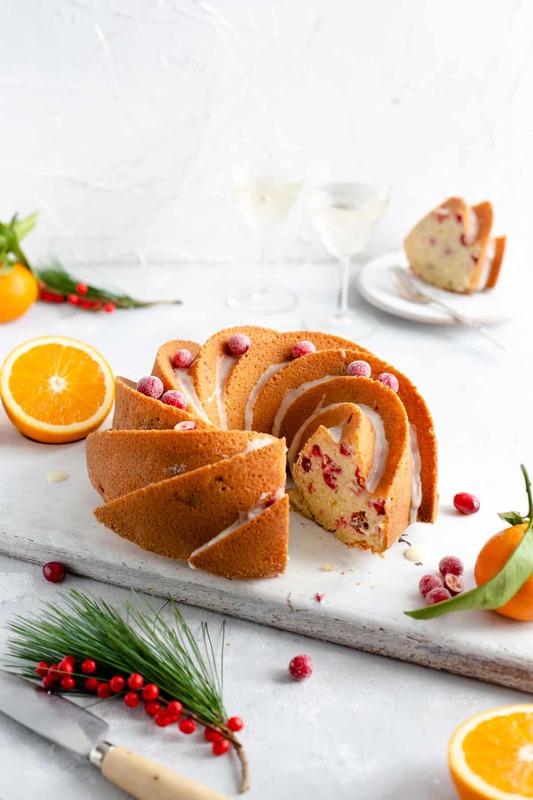 This orange and cranberry bundt cake is an ideal bake for the festive season! Impress your guests with this easy, but very effective and delicious recipe! …So please excuse me, while things are a bit quieter over here, but be assured that normal service will resume very soon! Now, let’s get into today’s recipe, shall we? 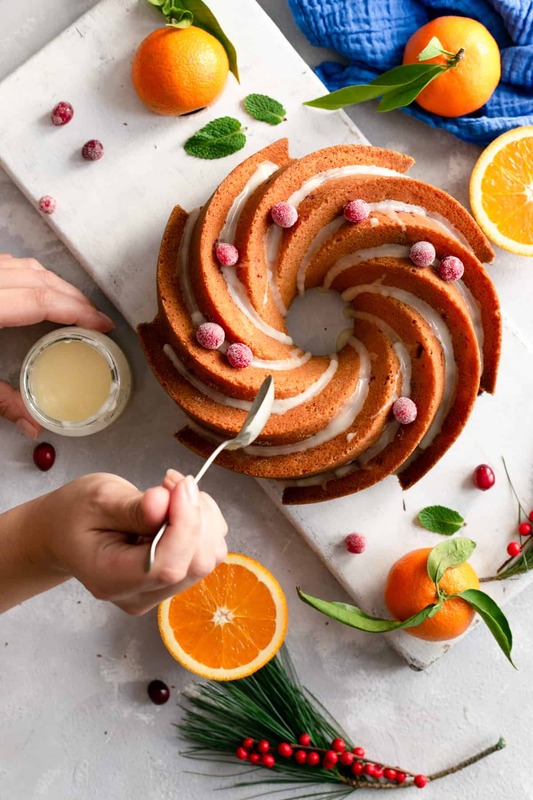 Orange and cranberry bundt cake- a seasonal classic! 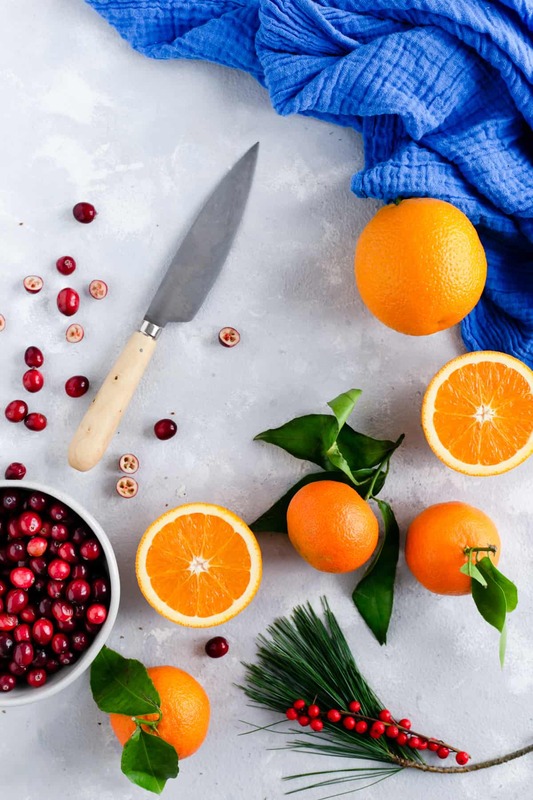 You know Christmas is just around the corner, when shiny, glossy cranberries and leafy clementines are making appearance in the shops all around. As I’m a sucker for seasonal produce, I’ve already stocked-up on both! While looking for some ideas as what to make with this combo, I came across the most delicious and festive recipe from lovely and super talented baker, Laura and her blog Tutti Dolci. I have fallen in love with it instantly, plus it reminded me of that fancy bundt cake pan I bought long time ago and barely used it! 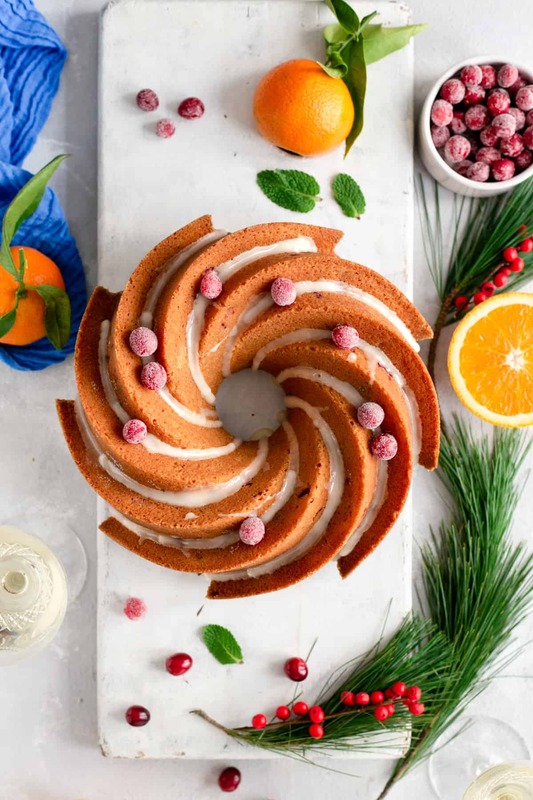 This recipe for orange and cranberry bundt cake may look a bit long and complicated, but I swear, it’s not!!! 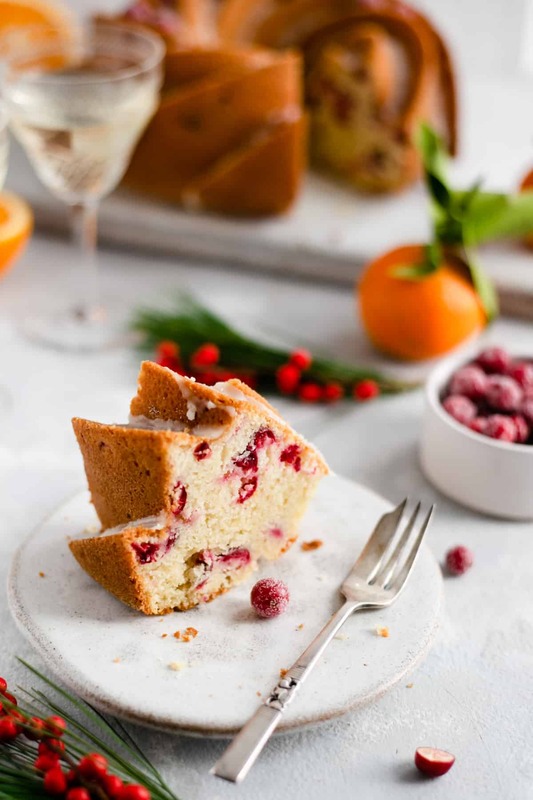 The flavours work beautifully together, with zesty oranges and sharp cranberries, balancing out the sweetness of the cake. 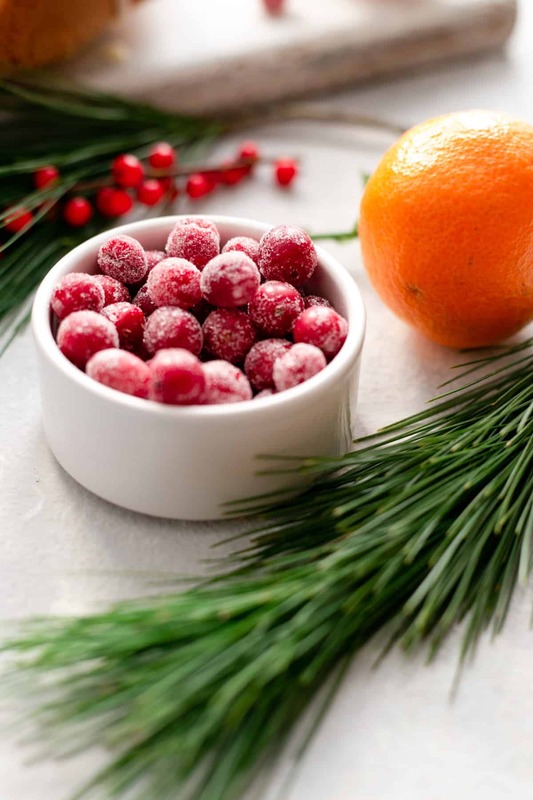 You can use frozen cranberries, instead of fresh ones, and oranges can be swapped for clementines or satsumas. Either way, this cake will smell and taste like Christmas! It may even make you put some festive tunes on while baking it! 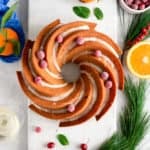 How to make this orange and cranberry bundt cake? Firstly, you don’t need a fancy cake pan/ tin to make it! In fact, you don’t need a bundt tin at all. However, this type of cake pan will give you a beautifully shaped bake, guaranteed to wow your guests around your Christmas table. If you are using bundt pan, make sure to grease it generously, as they can be a bit tricky to release the cakes from. The other tip, which always does the trick, is to dust greased pan with some fine breadcrumbs or flour. Start by mixing the dry ingredients (apart from sugar) together in a large bowl. You will need to reserve about 1 tbsp of this flour mixture, as you will use it to dust the cranberries with before folding them into the batter. Then, in a separate bowl (ideally in the standing mixer bowl), mix together the butter, sugar and zest on a medium speed, until they are pale and fluffy. Change speed to low and add eggs. While mixing eggs and sugar, pour the milk with vinegar into small jug or cup and leave aside for a couple of minutes. Don’t stress if it becomes lumpy, it meant to do that! Add vanilla and orange juice, and come back to your mixer. All what’s left is to gradually start adding the flour mix to the eggs and sugar, alternating with milk mixture. Finish off by folding the chopped cranberries. Bake! Sugared cranberries for the final touch! While the cake is baking, prepare your sugared cranberries. Simply submerge them in the sugar syrup and dust with some more caster sugar. It will give them an appearance of frosted berries, with a beautiful sparkle and a shine! Just as if they came straight from the winter wonderland! Drizzle is totally optional, but again, it will make your bake visually much more appealing to your guests, which, no doubt, you are trying to impress! 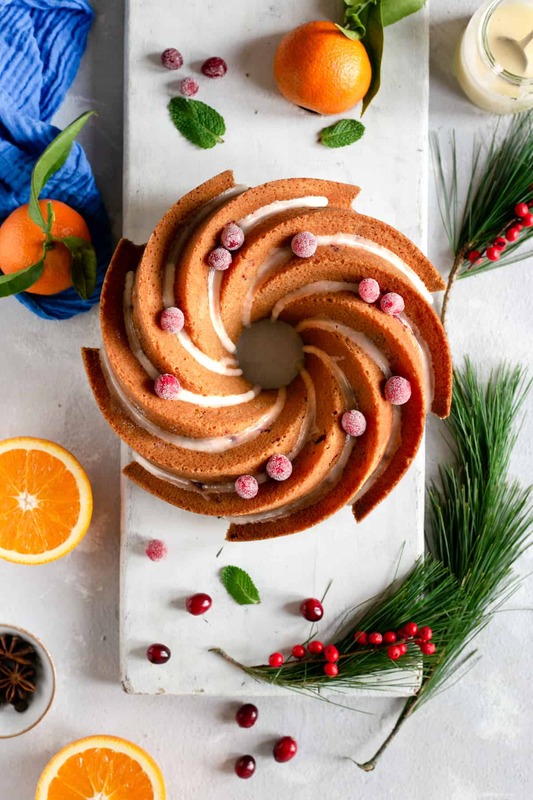 I really hope this orange and cranberry bundt cake have put you into festive spirit, and as always, I would love to hear from you! Let me know in the comments below if you try it, or if you have any questions. This easy bake will get you straight into a festive spirit! 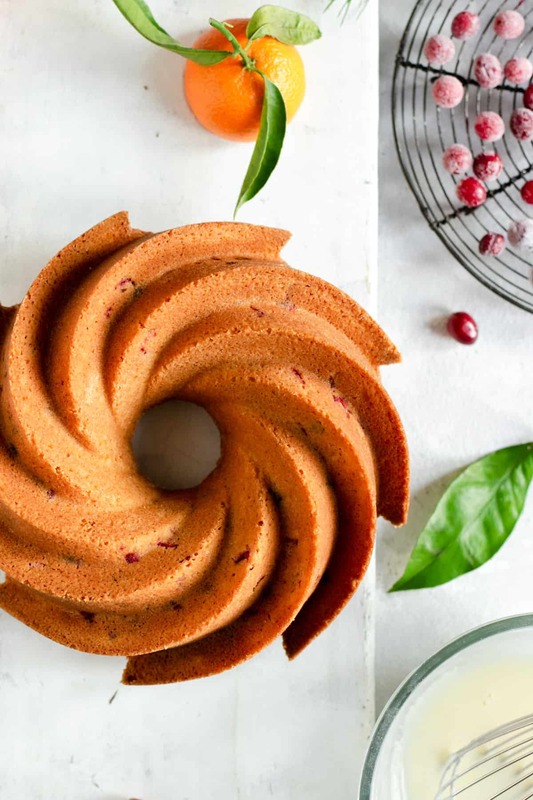 Classic combination of oranges and cranberries in a beautifully shaped bundt cake, perfect for your Christmas table! Pre heat the oven to 180 C (170 fan). Generously grease the cake tin with non-stick spray or butter and set aside. In a large bowl, combine the flour, baking powder, soda, salt and cinnamon. Set aside, and save about 1 tbsp of flour mixture in a small cup. In a separate bowl of your standing mixer, beat together the sugar, butter and orange zest on a medium speed until pale and fluffy. Reduce the speed to low, and add eggs, one at the time. Using a small bowl or measuring jug, combine together milk of your choice and apple cider vinegar. Set aside for couple of minutes. Don't worry if the mixture curdles. After a couple of minutes, add vanilla and about 4 tbsp of freshly squeezed orange juice into the milk mixture. Beat in the flour mixture in three additions, alternating with milk mixture (begin and end with flour mixture) until just incorporated. Toss the cranberries with reserved flour and gently fold into the batter. Spoon the batter into baking pan, tap the pan sharply on a sturdy surface to reduce air bubbles. Bake for 40- 45 minutes, until golden brown and inserted toothpick comes out clean. Take out of the oven and cool for about 15 minutes, then remove the cake from the pan and transfer to a cooling rack to cool completely. Place the sugar and water in a small saucepan over a medium heat. Allow the sugar to melt, and take off the heat. Add the cranberries, submerging them in the sugary syrup, then using a slotted spoon take them out and place on a cooling rack for about an hour. Add 2 tbsp of caster sugar into a small bowl and tip over the cranberries. Toss the cranberries around until covered in sugar. Mix the icing sugar and orange juice and drizzle over the cake. Top with sugared cranberries. I highly recommend dusting the greased cake pan with some fine breadcrumbs or flour. This will guarantee cake not sticking to the pan and easy removal. You may have to adjust the amount of orange juice in the drizzle, add some more to make it runny, or add less if you prefer thicker icing. If you have enjoyed this recipe, make sure to subscribe to my mailing list, so you get notified as soon as new recipes are published! These pictures are making me so happy! It’s an absolutely stunning dessert, well-deserving of any holiday table!!! Hey Kelly, thank you so much! I’m over the moon to read that this makes you happy! And I’m definitely putting this cake on my festive table! How can you go wrong with orange and cranberry to put you in the festive mood? That is my favorite bundt pan, I use it often, I find it stunning! Hey Nicoletta! Thanks so much for stopping by! It’s such a classic combo for the festive season, isn’t it? And I can’t believe I’ve had this bundt cake pan for so long and only used it twice! I’m definitely putting it into some good (and frequent) use now! This bundt cake is gorgeous! I also love the orange and cranberry combo. Definitely trying this during the holidays! Thanks Cathleen! Happy to hear that, let me know if you try it! Hey Sherri, thanks so much for stopping by! Orange and cranberries always give me festive feels, and I’m happy to hear you also like it! And these sugared cranberries will be a great addition to any cake! Oh Anna, this cake is simply gorgeous! Orange, cinnamon, and cranberry – could the flavors be any more festive! I am intrigued by the addition of apple cider vinegar! I have never used acv for baking but am really curious to experiment some more with it! Hey Kiki! Thanks for visiting and your lovely comment hun! Original recipe called for buttermilk, which I didn’t have, so as a substitute I’ve used ACV with milk. It creates the same texture and consistency as buttermilk would, and makes cake fluffy and light. Hope you will try it! It’s crazy how cranberry and orange flavors go well together and it is an incredible festive flavor profile. These photos are absolutely breathtaking! Hi Nicole, thank you so much! There is no better combo for the festive season than orange and cranberry! 😉 Happy you like it too! This cake looks so amazing Anna! ? The perfect dessert for a cozy coffee & tea party! That is SO pretty. I’ve actually just ordered a heritage bundt tin as a direct result. I need to make this! And gosh, orange and cranberry souns perfect. Hi Emily, thanks so much for your lovely comment! These tins are incredible, aren’t they? I actually have ordered two more yesterday (different shapes), because I love them so much! That cake is almost too pretty to eat! It’s so festive looking too. I would love to serve this at my next holiday party! Hello Anne! Thank you for your comment! And yeah, ALMOST too pretty, but still, the cake was gone in a matter of minutes! Everyone loved it, it’s such a crowd pleaser! Your photos are so beautiful! I wanted to lick my computer screen! I love the combination of cranberry and orange, especially in winter time. This bundt cake is definitely a winner. Where did you get this pan? thanks so much Lauren, that is so sweet of you to say! The pan is from Nordic Ware, it’s the heritage pan. Hope this helps! Hey Michelle, thanks so much for stopping by! Let me know if you tried it, I would love to know your thoughts! Orange and cranberry are one of my favorite combinations at this time of year. Your cake looks so mouth-watering delicious! This is just perfect for a holiday dessert table! Thanks so much Michele! So happy to read that you like this recipe and the flavours! Hope you will try it some time soon! Oh I just love the combination of all the festive flavours Anna! This cake is a worthy number for any festive table – a real stunner! I love what you did with sugared cranberries too, they look like they’ve travelled all the way from the winter wonderland!